The NordicTrack EXP2000 is a largely unremarkable machine. Like most modern treadmills, it folds for storage; you must be able to lift 45 pounds to safely lift the deck into a folding position. The most remarkable feature on this machine is a set of two small hand weights with their own storage pocket on the console. Although the weights are too light for a serious strength-training workout, using them can help you burn additional calories as you walk. The NordicTrack EXP2000's modest 1.75 continuous horsepower motor provides a maximum speed of 10 mph -- fast enough for a running workout, but the low horsepower rating makes this a poor choice for frequent long, hard runs. The treadmill motor-adjusts between 0 percent and 10 percent incline settings. Its cushioned 20-inch by 55-inch running deck is adequate, but may feel cramped if you have very long legs. The maximum user weight capacity is 275 pounds. The EXP2000 console comes with a built-in book holder, so you can read and walk at the same time. A small well on the right side of the console is meant to hold a water bottle. Two stationary handlebars beneath the console hold metal-plated pulse sensors. Grip one sensor in each hand and the treadmill will display an estimated heart rate on the console. The treadmill also displays your workout progress in terms of a 1/4-mile track graphic, located near the top of the console. You can control the treadmill's speed and incline manually, or you can select a preprogrammed workout that automatically adjusts those settings for you. The NordicTrack EXP2000 comes with five preprogrammed workouts: Mountain trail, Power Hike, Trail Run, Canyon Run or Gorge Trail. Press "Select Program" repeatedly until the indicator light illuminates beside the desired program, then press "Start" to begin the program. You can also customize two workouts of your own; press "Select Program" until the indicator light illuminates beside Learn 1 or Learn 2, then press "Start." Press "Record" and work out as if you were in manual mode. The treadmill will store your speed and incline adjustments for later replay. Like most cardio equipment produced by ICON Health & Fitness, the NordicTrack parent company, the EXP2000 is iFit compatible. 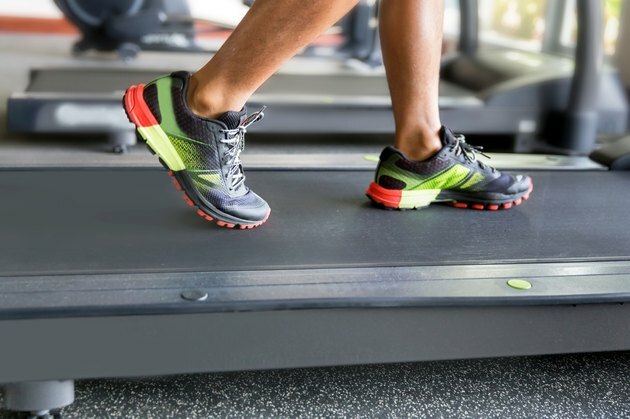 Connect the treadmill to any CD or video player, insert an iFit CD or video, and you've effectively expanded your treadmill's repertoire of preprogrammed workouts. You will hear and, in the case of video programs, see the personal trainer prompting you through the workout as the treadmill automatically adjusts speed and incline. The EXP2000 also comes with a safety key that must be inserted into the console for the treadmill to work. Remove the key when not in use, and children won't be able to accidentally activate the treadmill. The key is also a safety measure for you. Attach the key's lanyard clip to your waistband when you start using the treadmill. If you stumble or fall while using the treadmill, the clip will pull out of the console and automatically stop the treadmill.